Tragically, the last three San Francisco firefighters killed on the fireline were from our station, Engine 26, and died to save the lives and property of our neighbors. The circumstances of their deaths remind us of some unusual architectural traits of Diamond Heights that can be safety issues for both residents and emergency responders. In 2011, two firefighters entered the ground floor of a home with two stories visible from the street; but the house was on a hillside and had two other stories below street level. The fire was on a lower level and the crew had to enter and work above it—a risky operation because heat rises. Their entry allowed fresh oxygen into the house and may have caused a flashover, a sudden superheating of the entire interior atmosphere, which fatally injured both men. In 1995, a firefighter was trapped in a burning home when an electric garage door closed and left him no alternate exit. Keeping in mind some of the peculiarities of Diamond Heights homes, we offer some safety tips to address these and other fire situations. Be familiar with at least two exits from home, business, or other buildings where you spend time. Emergency exits must be openable from inside without a key or any special knowledge or skill. If your only exit door has an electric lock that could fail during a fire or power outage, or a deadbolt lock requiring a key to open from inside, it is a potential deathtrap for occupants and emergency responders. It should be modified, or another door with manual locks should be added. Little can be done to alter a hillside home to remedy the conditions that contributed to the 2011 firefighter deaths. Lower stories built into a hillside are confined spaces, where entry and egress are possible only from above and firefighting or rescue is difficult. As we saw in the Berkeley Way tragedy, a fire produces heat, smoke, and toxic vapors that can build up enormous pressure and then ignite explosively when fresh oxygen enters the building. If your building has levels below the street grade, equip them with smoke detectors. If they are to be vacant for any length of time, keep connecting doors closed to slow the spread of any fire that may start. In case of a fire in such a building, evacuate everyone, call 9-1-1, and advise the first arriving firefighters of your floor plan. This information will help them fight the fire more efficiently and safely. 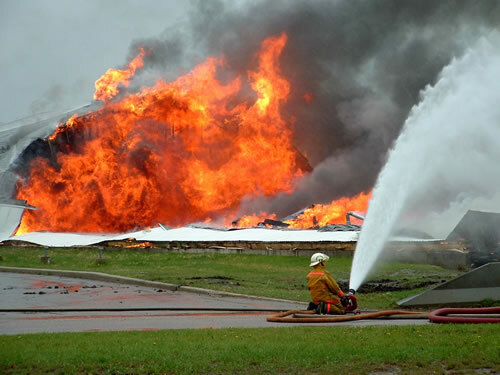 Be sure your homeowner’s or renter’s insurance is adequate to cover your current needs, and can replace property lost or damaged in case of a fire. Equip your home or business with smoke detectors and fire extinguishers. Select photoelectric detectors. Recent research shows that they respond sooner than ionization detectors to slow-burning fires, the kind likely to start in furniture or trash; and also to cause fewer false alarms. Change batteries at least annually. Choose ABC multipurpose extinguishers, which are safe to use on fires of Class A (ordinary combustibles: paper, wood, grass); Class B (flammable or combustible liquids: fuels, cooking oil); and Class C (live electrical equipment). Get the highest rated model you can physically handle. ABC extinguishers have alphanumeric ratings, e.g., 4A40BC. The first digit is the equivalent in gallons of water, multiplied by 1.25; thus, the 4 means a firefighting capacity comparable to 5 gallons of water. The second number is the extinguishing capability on a flammable or combustible liquid, in surface square feet. The C merely means the chemical will not conduct electricity. Learn to use an extinguisher before you need it. Keep it near an exit door, not in a corner or secluded spot where a user could be trapped by a fire. Inspect it regularly. If the pressure gauge is out of the green “OK” zone, have it refilled or replaced. Occasionally invert extinguishers and strike with your palm to loosen the dry chemical and keep it free-flowing; you should be able to feel the powder shifting inside. Trim grass and other vegetation clear of your building to provide a firebreak. The California Division of Forestry and Fire Protection defines the critical safety zone as 30 feet in all directions, which makes sense in an urban-wildland interface but may not be realistic in a city. Clear as much space as possible, so a grass or brush fire will not immediately spread to your building. Any property with landscaping should have a hose attached to a spigot, ready for use in case of a grass or brush fire. Remember: under most weather conditions, brush fires spread uphill. Safe, orderly storage of trash, combustible materials, and other articles can decrease fire hazards both indoors and outdoors. Do not accumulate oily or soiled towels, paintbrushes, or refuse; and keep solvents, paints, and other hazardous materials away from furnaces or other heat sources. Do not allow storage to block exit doors or pathways. Maintain furnaces, water heaters, fireplaces, stoves or other appliances in clean, working condition, consulting professional service providers or utility companies if necessary. Never try to fight a major fire. Anything bigger than a wastebasket is a job for the Fire Department. If you choose to fight a small fire, CALL 9-1-1 FIRST. Advise the dispatcher of your intention to fight the fire. Think P-A-S-S: PULL pin, AIM nozzle at the base of the fire from about 6 feet; SQUEEZE lever; and SWEEP extinguishing chemical in tight motions across the base of the flames. The extinguisher ratings described above (PREVENT AND PREPARE) are based on testing by trained, experienced users. Whatever your training or experience, do not waste the chemical in uncontrolled spraying. Avoid becoming trapped. Fight a fire with your back to the door. Never position yourself with the fire between you and the exit, or where it might force you into a corner. If it grows out of control and you need to abandon your efforts to put it out, close the door as you leave to slow the fire’s spread. Be safe even if you put out a fire yourself. If the Fire Department was not notified, call 9-1-1 as soon as the incident is over. Firefighters will check for “hot spots” or stray embers that could re-ignite later.